This section of our website features a wealth of information beyond the products we manufacture. The items to the left will answer many questions our distributors have regarding capabilities, equipment, special services and so much more! Please review each of the items to the left and you will have a greater appreciation for what a strong supplier Graphic Dimensions can be to your organization. We are a full service trade only manufacturer specializing in a wide variety of business documents and business printing. As a Graphic Dimensions distributor, it is very important that you register on our site and take advantage of the wide range of online services exclusively available to registered users. Our website is very informative about all of our products, services and capabilities. However, registered users can obtain a vast amount of customer service functionality at their desktop. Our website features and services include online reordering, proof administration, real time order tracking and shipment tracking, the ability to view your invoices and packing lists anytime and you can download our complete library of brochures, catalogs and marketing collateral. Register today, it’s easy! Graphic Dimensions is a dedicated and dependable manufacturer of a broad range of business printing. We are committed to consistent growth and achieve this year over year by exceeding the quality and service expectations of our distributor partners every day, because we all truly care. Acknowledgements: All orders are acknowledged within 24 hours of receipt via fax or email. Composition: To assist you in obtaining new orders and to lessen the burden of transitioning work to Graphic Dimensions, we do not charge for standard composition. There is a minimal composition charge for complicated layouts such as medical forms and terms and conditions backers. Credit Card Payments: We accept Visa, MasterCard, Discover, and American Express. Prompt pay discounts are not allowed when paying by credit card. Credit Terms: We offer a 1% prompt pay discount if payment is received within 15 days of the invoice date. Otherwise, our terms are Net 30. An interest charge of 1.5% (18% annual) will be applied to all invoices not paid within 30 days of the invoice date. 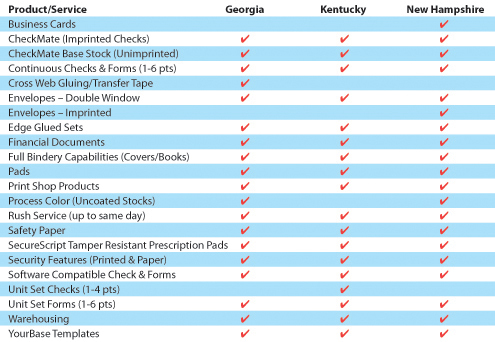 Customers: We are a wholesale printer and sell through a network of authorized resellers. Deliveries: In general, all products ship in 5 days or less. Online repeat orders of 10M or less ship in 3 days. Checkmate and blank stock orders ship in 24 hours. Double window envelope orders ship the day the order is received. Distributor imprints: We will print your imprint at no charge upon request. Ink: All inks are soybean based laser safe inks. Ink, Thermochromic: We offer 2 standard colors, magenta and pms 277 blue. Other colors are available. Labeling: Our name doesn’t appear on the carton. Our distributor's name will appear as the shipper. Numbering: MICR and Arabic numbering are available in bleed through and non-bleed through. Arabic numbering is available in red and black. Custom colors are available. We do not charge for guaranteed no missing numbers. We feel it is our job to number your order correctly, without an upcharge. Overrun/Underrun: +/- 10% is standard on all orders under 10M. A 5% upcharge applies for exact quantities. Exact quantities on orders 10M or larger are offered without an upcharge. Our Checkmate line is no overrun unless it is requested. Pick- Ups: An order may be picked up anytime our facilities are open. We will do whatever we can to accommodate pick- ups during non-business hours. Price Quotes: Quoted prices are valid for 30 days of the price quoted. Most RFQ’s are responded to within 2 hours. Proofs: Proofs are sent within 2 business days or sooner. We offer proofs as PDF’s, acetates or black and white paper. Reruns: Regardless of responsibility, reruns are shipped within 24 hours in most cases. Rush Deliveries: We offer rush deliveries from same day to three days. Split shipments: Split shipments are available for a nominal upcharge. Retention of order information: Job dockets are stored for 2 years. Electronic information is stored for 5 years. Warehousing: Secure climate controlled warehousing is available at all locations. Graphic Dimensions welcomes new distributors. Whether you are a seasoned professional in the business forms industry, expanding your existing offerings, or just breaking into the market, we will work with you to help you be successful in your endeavors. Graphic Dimensions' products are distributed exclusively by independent distributors - we do not sell direct. Our distributors are the most vital component of our business and we will consistently go the extra mile to ensure a successful partnership. These terms and conditions and any documents attached hereto and incorporated herein at the time of execution constitute an offer to provide the products described and, when accepted by the Buyer, shall constitute the entire agreement between the parties (the "Agreement"). For purposes of this Agreement, the term "Seller" shall mean Graphic Dimensions. Buyer's failure to object in writing to this Agreement prior to Seller's commencement of any work or shipment of the goods described in the relevant purchase order, order acknowledgement or other document shall constitute Buyer's acceptance of this Agreement. Any terms proposed by Buyer in any communication or document, including without limitation, preprinted terms on a purchase order, which modifies, differs from or conflicts with this Agreement shall not apply unless specifically agreed to in writing by Seller. 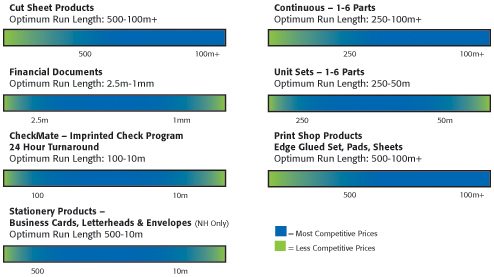 Prices are effective for thirty (30) days or such period as specifically provided in writing, except that prices of materials (such as paper, ink, plates and adhesives) and outside services are subject to change at any time. Seller will notify Buyer of price changes. Pricing does not include postage and does not include freight charges. All artwork, type, plates, dies, tooling, negatives and other preparatory items, when fabricated or procured by Seller, shall remain the exclusive property of Seller, notwithstanding any expense or preparation fee charged to Buyer, and no use of the same shall be made by Buyer without the express prior written consent of Seller. Shipping dates are estimates only and are based upon the prompt receipt by Seller of any approved proofs, artwork, special materials, shipping instructions and other custom specifications needed for production of the product. Seller shall not be responsible or liable for any losses resulting in the fulfillment of any of the terms of this Agreement is delayer or prevented by revolutions or other civil disorders, wars, acts of enemies, strikes, fires, floods, acts of God, or by any other cause not within the control of Seller. Until all liabilities of Buyer have been paid in full, Buyer hereby grants Seller a security interest in any and all of Buyer's products, artwork, types, plates, dies, engravings, negatives and other preparatory items now or hereinafter possession of Seller as collateral for the payment for any and all liabilities of Buyer to Seller, including, but not limited to, attorney's fees incurred by Seller in regards to any such liabilities. Seller may from time to time record such financing statements, notices or other documents, or perform such other acts Seller deems necessary to maintain a valid and perfected security interest in the aforementioned items. Seller warrants that the products delivered to Buyer under this Agreement will conform to any specifications set forth in the applicable purchase order or other similar document expressly agreed to by Seller. IF SAMPLES WERE SHOWN TO BUYER, SUCH SAMPLES WERE FOR GENERAL INFORMATIONAL PURPOSES ONLY AND SHALL NOT BE DEEMED A WARRANTY BY SAMPLE OR OTHERWISE HAVE ANY LEGAL EFFECT. THE WARRANTY IN THIS SECTION 10 IS IN LIEU OF ALL OTHER WARRANTIES, EXPRESS, IMPLIED OR STATUTORY, INCLUDING WITHOUT LIMITATION, ANY WARRANTIES OF MERCHANTABILITY, FITNESS FOR A PARTICULAR PURPOSE OR ANY WARRANTY OF NON-INFRINGEMENT OF THIRD PARTY RIGHTS, AND ALL SUCH OTHER WARRANTIES ARE HEREBY EXPRESSLY DISCLAIMED. THE SOLE RESPONSIBILITY OF THE SELLER SHALL BE TO PRODUCE THE GOODS IN ACCORDANCE IWHT THE SPECIFICATION OF THE BUYER. Upon any breach of warranty or breach of contract, the Buyer's sole and exclusive remedy shall be to receive reimbursement of the price paid for the defective product (or the portion thereof with respect to which damages are claimed) or, at Seller's option; Seller may elect to replace any defective products. WITHOUT LIMITING THE GENERALITY OF THE FOREGOING, SELLER SHALL NOT BE LIABLE TO BUYER FOR ANY AMOUNT IN EXCESS OF THE PRICE PAID FOR THE ALLEGED DEFECTIVE PRODUCT INCLUDING, WITHOUT LIMITATION, FOR ANY DIRECT, INDIRECT, INCIDENTAL, SPECIAL, CONSEQUENTIAL, OR EXEMPLARY DAMAGES, INCLUDING, BUT NOT LIMITED TO, DAMAGES FOR LOSS OF PROFITS, GOODWILL, USE, DATA, COSTS OF ACQUIRING SUBSTITUTE PRODUCTS OR OTHER INTANGIBLE LOSSES. Claims for defective or damaged goods or for shortages shall be made by the Buyer in writing within thirty (30) days after shipment and are otherwise waived. If Seller cures such default, or proceeds diligently to complete the cure within thirty (30) days after receipt of the Buyer's claim, Seller shall not be in violation of this Agreement. All goods claimed to be defective or nonconforming shall be returned to the Seller. Seller’s acceptance of all goods so returned shall not be deemed an admission that the goods are defective or nonconforming and, if Seller finds that the returned goods are not defective or nonconforming, Seller will reship goods to Buyer and Buyer will be charged for any shipping charges incurred by Seller. This Agreement shall be governed by and construed in accordance with the laws of the State of Georgia, without regard to the conflicts of law rules thereof. Buyer, for itself and its successors and assigns, irrevocably agrees that any suit, action or proceeding initiated by Buyer and arising out of or relating to any transaction subject to this Agreement must be instituted only in a United States District Court located in Atlanta, Georgia. Buyer, for itself, generally and unconditionally accepts and irrevocably submits to the exclusive jurisdiction of the aforesaid courts. This Agreement is binding upon Buyer and Buyer's heirs, administrators, executors, successors, personal representatives and assigns and shall inure to the benefit of Seller and its successors and assigns and supersedes all other agreements, written or oral, regarding the subject matter hereof. This Agreement constitutes the sole and entire agreement between Seller and Buyer. No course or prior dealings between the parties and no usage of trade shall be relevant or admissible to supplement, explain, or vary any of the terms of this Agreement. This Agreement may be modified only in a written instrument signed by Seller and Buyer.